In order to get the most out of your marketing dollars, you need to tap into the latest B2B trends so you can get the highest ROI for your business. In the good old days, selling was a one-to-one interaction -- merchants talk to prospects, understand what they want, and offer a solution. Unfortunately, this kind of personal interactions wasn't scalable and the use of conversational selling to nurture relationships and acquire customers had been costly for most businesses. Until now... with the widespread use of technologies such as live chat and messaging apps (e.g., Facebook Messenger, WhatsApp,) businesses can apply conversational selling strategies at scale without spending an arm and a leg on hiring a large sales team. With conversational selling, you can attract visitors to your website, convert them to leads, follow up on previous interactions, nurture relationships with targeted content, connect prospects with your sales team when the time is right, and improve customer retention by adding value or providing timely product support. The key to successful conversational selling is to make sure that the interactions are relevant and contextual by providing your prospects and customers with the most helpful information in real time. To effectively personalize these conversations, you need a robust customer data management platform that allows your team to access all customer data in one centralized location. By combining information such as customers' purchase histories and preferences with real-time interactions, you can deliver the most relevant experience to each individual buyer and increase conversion. The new generation of B2B buyers relies heavily on online reviews, peer recommendations, and social media content to inform their decision-making. To harness the power of word-of-mouth marketing in the digital era, include a robust review section on your eCommerce site's product pages and ask your customers to leave a recommendation after they make a purchase. In addition, leverage the power of third-party review sites to get in front of more prospects with high purchase intent and drive quality traffic to your website. You can also turn loyal customers into your sales team by nurturing relationships and building advocacy. For example, deliver exclusive content, offer special discounts, host appreciation events, and create a referral or affiliate program. Last but not least, social media can be your ally when used strategically to engage with your audience. For B2B companies, LinkedIn is a particularly effective platform for connecting with the right prospects, sharing product news, adding value, and staying top of mind. 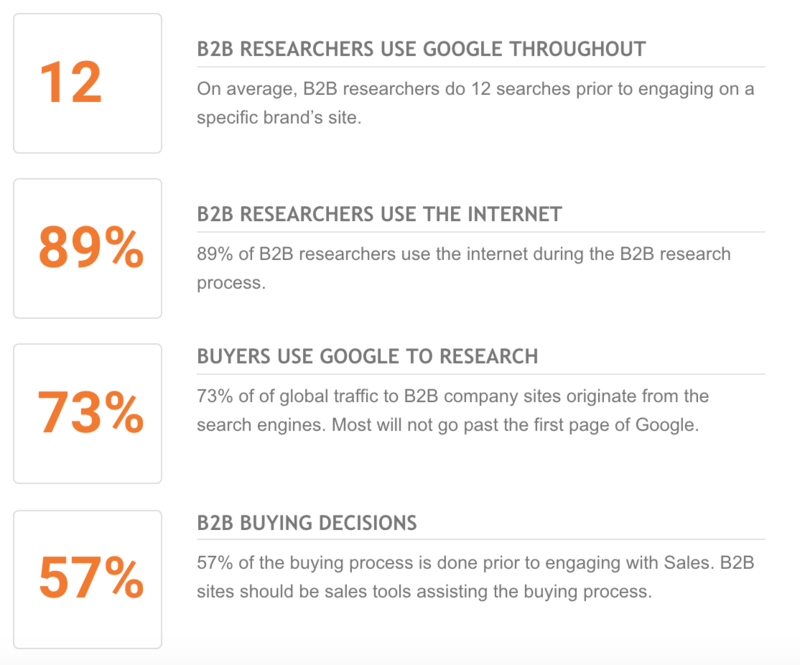 89% of B2B buyers use the Internet during their research processes so appearing at the top of search engine results is the key to attracting new prospects to your business. However, you can't just soldier on with a keyword strategy from five years ago. As Google evolves its algorithm, businesses that focus on creating relevant, contextual, and user-friendly content are winning the SEO game. 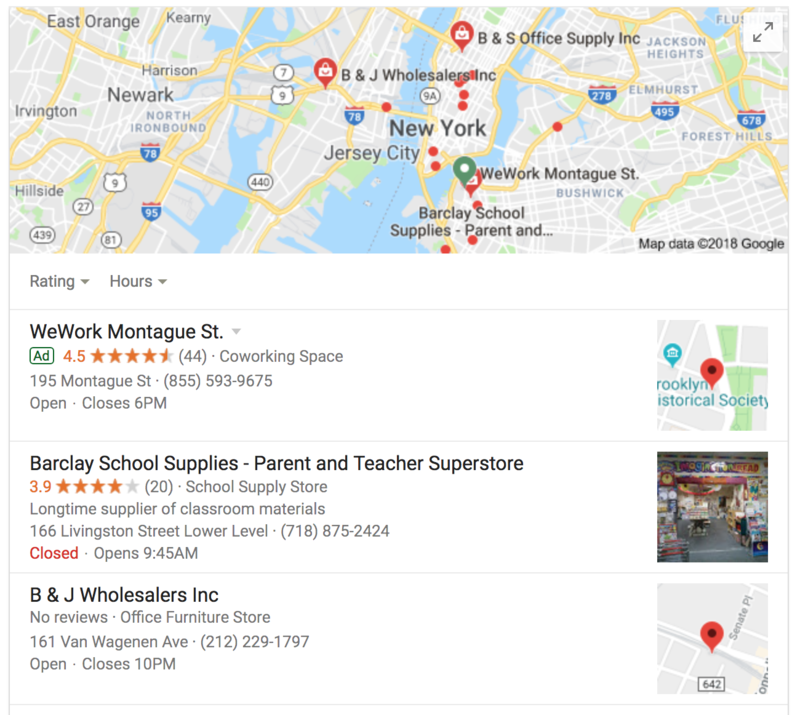 If you have a physical store or service a specific geographic region, optimizing for local searches allows you to rank in the "local pack," which is shown at the top of relevant search results. Over half of all Internet traffic comes from mobile devices and Google is now prioritizing mobile-optimized websites in its search results. As more B2B buyers are using their smartphones to conduct business, having a mobile-first website also helps increase dwell time, decrease bounce rate, and reduce load time -- which are all positive ranking signals. Not only does 70% of all search traffic originates from longtail keywords but people that use them also have higher purchase intent. Optimize each of your web pages with different longtail keywords to increase the chances that your website will appear in the most relevant search results. The use of LSI keywords provides context for Google so it can more accurately understand your content and improve the quality of its search results. Visual content increases engagement, improves dwell time, and encourages sharing -- which are positive ranking signals that can boost your SEO ranking. In fact, it's predicted that video will represent 82% of all web traffic by 2021. For years, marketers have been collecting a large amount of data yet unable to fully utilize the information to extract actionable insights. With the maturation of AI-driven marketing technologies, B2B companies can now leverage big data to analyze customer behaviors and create personalized content and offers to increase conversion rates. For example, data-driven marketing strategies allow businesses to deliver smart content -- highly personalized information and offers that match the customer lifecycle stages -- via a variety of touchpoints such as website, email, social media, live chat, messenger, phone, and more in real-time to nurture relationships and accelerate the sales pipeline. The use of data and technologies is allowing B2B companies to effectively implement inbound marketing and account-based marketing (ABM) strategies, which rely on having a deep understanding of the customers' preferences and behaviors to deliver a highly-personalized and relevant user experience. In addition, the ability to distribute customized content and track results will help businesses amplify the power of content marketing to attract the right prospects, nurture relationships, drive conversion, and improve customer retention. If you can't convert your website traffic into buyers, you're spending a lot of ad dollars for naught. Conversion rate optimization strategies help you boost your ROI and increase revenue. Improve your product pages by writing unique and detailed product descriptions, using high-quality images and demo videos, and including product reviews. Also, make sure the call-to-action (e.g., "add to cart" button) is easy to locate, especially when the page is viewed on a mobile device. Use heatmaps to analyze users' interaction with your website so you can optimize the user experience. Streamline your checkout flow to reduce cart abandonment and improve customer retention. You should also offer a variety of payment options and a robust account management section to facilitate the purchasing process. Add retargeting pixels to your website and use remarketing ads to drive traffic back to your website. B2B buyers are demanding a customer-centric purchasing experience that's relevant, contextual, helpful, human, and streamlined. More B2B marketers will leverage a variety of marketing technologies to deliver a highly personalized user experience geared toward winning trust and building relationships at scale. What are the top marketing trends for 2019? Find out how to boost your lead generation and sales through digital transformation.